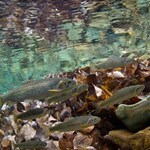 The Middle Fork of the Salmon truly has it all! 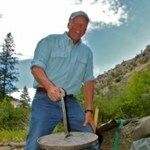 Wonderful fishing, exciting whitewater Hot Springs on the Middle Fork Salmonrafting, natural hot springs, vast geologic and anthropologic history, a plethora of hiking trails, amazing scenery, wildlife and more! We don’t want you to have to choose between any of these fun activities; we want you to experience all of them! 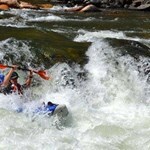 The combination fishing and rafting trip on the Middle Fork is the perfect way get the best of everything. Fun Ride in a Drift BoatWith this option, guests will spend half of each day fly-fishing and floating in one of our comfortable and maneuverable drift boats and then spend the other half relaxing on the couch like seat of a big oar raft or taking on the waves in an inflatable kayak or paddle raft. 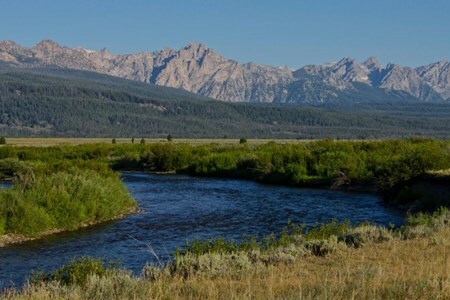 The Middle Fork of the Salmon offers world-class fly fishing opportunities with approximately 2,400 native Rainbow and Westslope Cutthroat Trout per mile. This was the first ever catch-and-release stream in the country and has been protected as the crown jewel of the West for trout fishing. Our drift boats are built to provide the perfect fly-fishing platform to access the fish and to fish directly from the boat. When riding in the rafts there is more time to stop and explore the historical sites, hot springs, or go for a hike along the way. The canyon scenery of the Middle Fork of the Salmon River is truly breathtaking.Rafting on the Middle Fork Salmon River On this 100-mile stretch of the Frank Church Wilderness, we float through the heart of the largest wilderness area in the continental United States and drop 3,000 feet in elevation. Each day on this exciting river adventure is unique in activities and scenery, the abundance of which makes the combination trip the most popular option for guests who want to experience it all. Each individual person in your group can choose to further customize their trip between the fishing, rafting or the combination options. Please contact us for more details regarding such customizations. Camping with Helfrich Outfitters on the Middle Fork is better labeled as ‘Glamping’, or glamorous camping, because of the deluxe accommodations that are provided at every campsite. 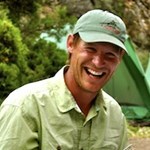 Upon arriving in camp each afternoon, guests can expect everything to be set up and ready for them to enjoy. Each of our spacious tents accommodates 2 guests with comfortable cots and air pads for sleeping. The site is equipped with dining tables, lounge chairs, a hot shower, warm water wash station, hand washing facilities, a privacy toilet, ice and cocktail table, and a complete kitchen. When guests arrive in camp they can pick a tent, grab a cold drink, munch on appetizers, relax and enjoy activities around camp. Each trip is focused on the customer’s interests and guides are available to lead activities by request. The afternoons and evenings provide plenty of time for additional fishing, swimming, hiking, artifact hunting, photography, playing games, soaking in hot springs, reading a good book with toes in the water or just relaxing and watching the river float by. The gourmet food on the Middle Fork makes this trip even more inviting. All meals are prepared in Dutch ovens and on the barbeque over open coals. Fresh baked Dutch oven breads, made from scratch, are prepared each day along with top quality meats and fish. Each meal is accompanied by plenty of fresh fruits and vegetables. Duel entree dinners and a wide variety of side dishes provide great options at each meal. If there is any room left in ones stomach after the evening’s premier event, a delightful dessert is sure to follow. Riverside lunches of freshly made salads, fresh fruits and rich sandwich spreads are prepared each day on a shaded river bank. Lunch stops are a great time to relax in a lounge chair in the shade, go for a swim, lay out for a sun tan, read a good book or explore the surrounding area. Best of both worlds. 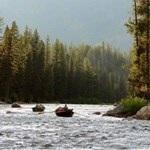 Spend half of each day fly fishing in drift boats and the other whitewater rafting, hiking and exploring. Best family getaway! Disconnect from technology, reconnect with family and friends. Deluxe camps complete with full size tents, cots, hot showers and family style dining. While it may seem nonsensical to think of Marilyn Monroe and fly fishing in the same breath, the Salmon River and the “blonde bombshell” are permanently linked together in American ... morefolklore. Given it’s wild runs and deep canyons, the river acquired the moniker of the “River of No Return, and was made famous when Monroe and Mitchum starred in a 1954 film with the same name. In fact, the Salmon runs unobstructed for 425 miles, making it the longest free-flowing river within one state in the lower 48. Not only are its rapids wild and untamed, the Salmon also travels through two nationally designated preserves, the Frank Church River of No Return Wilderness and the Gospel Hump Wilderness areas. Recognized for its scenic importance, Congress declared the 46 miles of the river from North Fork to Corn Creek as a national recreational river and the 79 miles from Corn Creek to Long Tom Bar as a wild river. At points along the Salmon its granite walls are one-fifth deeper than the Grand Canyon and over 180 miles of the river is more than one mile deep. 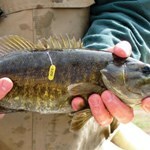 Fed by several tributaries such as the Yankee Fork, South Fork Salmon and Little Salmon, the river supports both cold and warm water fish including smallmouth bass, bull trout, sockeye salmon, Chinook salmon, squawfish, sucker and catfish. Legend has it that white sturgeon over 12 feet long and over 100 years old also inhabit these waters. 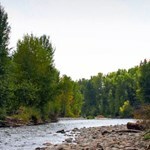 The Salmon and Snake rivers provide critical habitat for steelhead trout and Chinook salmon. These fish require both salt and fresh water and use these streams to navigate from the rivers where they spawn, to the ocean where they spend their adult lives. The river offers high quality sport fishing for resident populations of cutthroat and rainbow trout as well as steelhead and mountain whitefish. 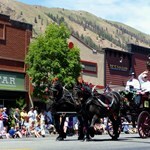 Like many western towns, Hailey came into being during the gold rush of the mid 1860’s, attracting speculators, adventurers and roust-a-bouts. While much of the city’s past is kept ... morealive by its Historic Preservation Commission, as indicated by its substantial list of National Registry Homes, the town is now a small gem with a sophisticated palate and yen for the visual and performing arts. Located east of the Smoky Mountains, often referred to as Idaho’s “forgotten mountain range,” the town is also known for its scenic beauty and year round, outdoor activities. Friedman Airport is the airport of choice for both public and private flyers coming to Sun Valley to ski, fish or just have fun. 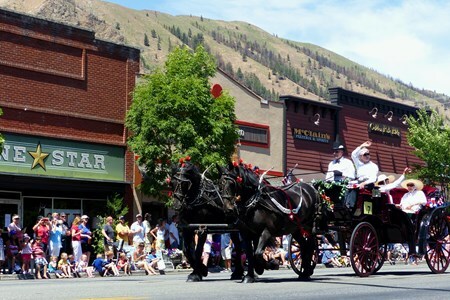 Festivals and events take place throughout the summer and winter months, including an Arbor Day celebration, fiddler competitions, world-class skateboarding contests, antique fairs, and the Rough and Tumble, July 4th Rodeo. Its most unusual claim to fame may be the Sun Valley Bike Festival where cyclists race as they drag burning logs behind their bikes. Once you arrive, whatever lodging you decide upon, and there is a plethora of choices, you will not be far from great fly fishing. 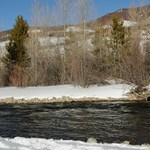 The Big Wood River and Silver Creek are a stone’s throw away. In addition to myriad streams, there is Little Wood, Trail Creek, the Big Lost, Magic Reservoir, Mackay Reservoir, the Salmon River and the South Fork Boise to explore. For those who prefer cold mountain lakes, the list to pick from is long and inviting. For the truly dedicated and hardy, some of Wood River’s best fishing takes place in the winter months. What’s your reward for withstanding the cold? 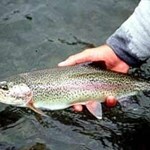 Hopefully, plump 14 to 18 inch rainbow trout. 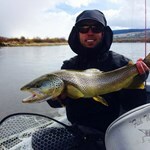 Welcome to the best drift boat fly-fishing trips Oregon & Idaho have to offer! 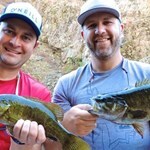 Join the Helfrich family for a drift boat fly fishing trip in Oregon or Idaho. 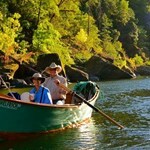 Helfrich River Trips ... moreare known as the most deluxe trips offered in the picturesque Pacific Northwest. The vacation of a lifetime, these trips offer a wonderful experience for guests of all ages. "History" and "tradition" are words that have different meanings to different people. To us, at Helfrich River Outfitters, they are extremely important because they represent much of what we stand for. 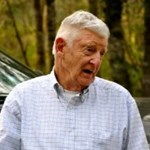 The Helfrich name has been synonymous with river running since the mid 1920's. We are committed to excellent service and the safety of our guests. With state-of-the-art equipment, delicious freshly prepared meals, and a friendly experienced professional staff, we are able to provide river experiences that are second to none. When people ask who they entrust their river vacation with, HELFRICH River Outfitters comes up first every time.Not only are we the oldest and most experienced company on the rivers we specialize in, but our safety record has been flawless since the beginning. In 1925 when Prince Helfrich first started guiding on the McKenzie, he had an edge on other fishing guides because he added value to his trips with extra things like frying the fish his clients caught on the river bank or bringing one of Marjorie Helfrich’s home made pies to share at lunch time. The concept of added value to our trips has continued for 87 years, and is adopted a Helfrich standard. Now into our fourth generation, our trips continue to improve and evolve.We have and will continue to always make the trips the best that they can be for our clients. The safety and comfort of our clients is our first concern. The experience of our crew members and their accommodating and friendly attitudes makes our guests know they are in good hands. Cancellations made 14 days before will be fully refunded. Cancellations made 7 days before will be refunded 50% of the amount paid. 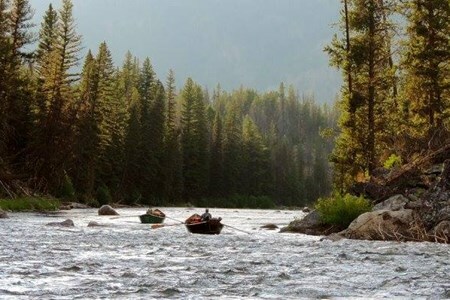 Payment directly with All-inclusive Fish and Raft Combination on the Middle Fork Salmon River with Helfrich Outfitters.